Go where you will in America; ask whomever youmeet, "What of man's quest of comfort?" and they will say: "Make alarge factory to flourish where only a small factory flourished before; that is theway to comfort." For in industrialized America everybody has finallycome to believe that a high standard of living is impossible without mass production,without mass distribution and without mass consumption. And now when everybody has finally come to believe,the very foundations of our factory civilization are becoming less and less secure. Something inherent and ineradicable; somethingwhich tends to offset the low costs of factory production; something which interfereswith the contribution of the factory to material well-being; something which revealsthat a factory civilization cannot be the end of mankind's quest of comfort, is makingitself visible. This thing we must now seek. Why did the factory come into being? How didthe factory come to its present-day dominance of all the activities of mankind? Whatis likely to be the effect of the innumerable efforts now under way to regulate andsocialize it? Some of these questions have been much discussedfrom certain aspects. They have, however, been too much discussed in connection withburning controversies between capital and labor and between capitalism and socialism.There has been too little discussion based upon objective studies of the factoryitself, and the factory system of production, distribution, and consumption. We have been very much like two groups of menheatedly discussing the question of how rapidly automobiles should be driven. Onegroup, fixing its attention upon such matters as the condition of the highways andthe safety of pedestrians, insists that no automobile ought to be permitted to travelat a speed in excess of ten miles per hour. The other group, fixing its attentionupon other matters altogether, such as the great boon which presumably flows fromany increase in the speed of transportation, insists that the automobile should becompelled to travel at the highest rate of speed at which it can be driven. But bothapproaches to the question look too much to factors outside of the automobile itself.An objective approach to the question would first of all involve a study of the optimumspeed at which the automobile should travel--the speed which would enable it to deliverthe maximum of service at the minimum of cost--and then it would consider what changeswould have to be made in the highways and in the rules regulating traffic so as tomake it possible for the automobile to travel at that speed with maximum safety. So we must approach this matter of understandingthe factory system. It is useless to describe the factory, factory products, factoryworkers, and all the consequences which flow from the factory system until we studythe economic force which brought the factory and the factory system into being andwhich has ever since been at work sustaining and promoting it. The factory is nota phenomenon of nature like a mountain or a river. It is an artifice of man. It isas distinctly an artificial creation as the mountain ,or river is distinctly a naturalcreation. To understand the inner significance of the factory, we must thereforetake account of the motives which actuated man in producing it and which are responsiblefor its spread all over the world. Having considered these preliminary questionswe must then ask ourselves: What types of products lend themselves to factory production?What is the size to which the factory of necessity tends to develop? What are themethods by which factories have to be managed and controlled? These questions mustbe answered objectively: by a study of the factory itself and the system which isnecessary if it is to function most perfectly as a factory. Only in this way willit be possible to distinguish between what is accidental and what is inherent inthe factory. Child labor, for instance, is certainly a socialcalamity which seemingly the factory inflicts upon mankind. But it is in realitya calamity which has its origin in the unregulated private ownership of the factoryand the factory system. It can be ended at any time, either by adequate legal regulationwith continued private ownership, or by the abolition of private ownership and thesubstitution of state ownership. It is no more an inherent attribute than smoke orsmell, underpayment or unemployment and similar present day evils, all of which canbe eradicated by mere changes in factory organization, operation or ownership. Finally we must try to answer certain questionswhich have to do with the future of the factory and of factory civilization. The whole world is being industrialized. Theprocess of industrialization which took over fifty years in Japan could now be executedin about one-fifth of that time. Within a decade Italy and Russia, India and China,Mexico and Latin America may be so industrialized that exportation of many of thecommodities which other nations are now supplying them will practically cease. Industriesin all countries will then be forced to look only to their domestic markets for outletsfor their production. Will the intense rivalry which will then developbetween factories striving to sell enough to keep their machines operating to capacityreduce prices to levels involving long periods of operation at a loss? Will the competitionbetween the factories produce an excess of losses over profits in industry as a whole?Will the competitive demoralization which today exists in the coal industry and thetextile industry and the food industry spread to all industries? Will some form ofcooperative control be necessary in order to insure continuance of production? Willsocialism be the ultimate solution of the problem of producing the things mankindneeds and desires when private industry will cease producing them because it cannotdo so at a profit? I am firmly convinced that this objective studyof the factory and the factory system for which I am pleading will make it clearthat the industrialized nations will ultimately be driven to the socialization ofproduction and distribution. The magnitude of the social problems which are beingcreated by industrialization; the need for outlets for factory products; the publicdemand for social control of the factory, will force socialization upon the nations. When the present period of corporate ownershipreaches its point of optimum development; when ownership of stocks and bonds shallbe nationwide; when management shall have increasingly been turned over to industrialengineers; when the captains of industry will find it less and less possible to keepthe huge enterprises which they direct from wiping out profits in competitive strugglesfor orders for their plants, there will develop a general acquiescence in some formof social liquidation of private ownership of the factory. There are already plenty of straws to show whichway the wind is blowing. Today, at the very time when the United States Chamber ofCommerce solemnly issues pronunciamentos in favor of less and less interference bygovernment in business, American industry itself is actually engaged in buildinglegal and statutory foundations for consolidation, for monopoly, and for governmentregulation. Evidently there is something inherent in the factory--in a system ofproduction wh ch gets larger and larger all the time, which tends to consolidation,regulation, socialization; some force of which business men generally are not cognizantand to which they continue to voice hostility even after they have accepted it inpractice. Consolidation ... offers the solution of other problems of American	industry. In many cases the existence of uncontrolled competitive effort has made	profit for some American industries impossible. For nearly five years the textile	situation has presented a most unalluring picture. Here and there textile corporations	have been successful, but, by and large, the entire industry has presented most depressing	profit figures to its owners. Decrease of sales and inefficient management have contributed	in important measure to the unhappy situation. But the existence of a large number	of highly individualized corporate units and the resulting competition have been	the fundamental causes of the lean years during which the textile business has starved	upon half rations. The need for keeping the wheels and looms of mills running has	encouraged the sale of goods at unprofitable prices. And any bulge in demand that	might have been momentarily created has been inundated with a tremendous supply that	resulted from the desire of each mill to get its full share of the apparently available	sales market. The selling custom of the industry also added to the problem of the	mill. The plan whereby the whole sales responsibility is turned over to an independent	sales agency--called commission merchant or factor--grew originally out of the necessity	of financing the production of the mills, but it has transferred the ownership of	the sales market for the products of the mill from the producer to the commission	agent. The necessity of controlling production and eliminating the	guerilla warfare that results from unlimited competition actually screams for consolidation	within the textile industry in America. Moreover, the wisdom of the producer's possessing	unquestioned title to his own sales agency and his own sales market can only prompt	the inclusion of the function of sales among the processes of the new consolidated	units which are inevitable in the industry. The problem is already serious--almost	tragic in New England--and it will become more serious as Europe begins to pay its	annual interest charges in the textile values which she is so well fitted to create. With mergers the textile business of America may be able to	prosper; without mergers, its hope of rehabilitation is desperate indeed. Recognition of these facts is not confined toindustrialized America. In industrialized Germany students of this question are sayingthat the epoch of the freedom of German industry and commerce is rapidly and inevitablydrawing to a close. A new era is dawning which fulfills Marxist prophecies of Governmentcontrol. This was the gist of a recent article by Dr. E. Schmalenbach, a professorat the University of Cologne, whose knowledge of economics was considered by theGovernment so extensive that he was made chairman of the commission entrusted in1927 with the investigation of the Ruhr mining situation. "The predictions of the founder of Marxismare being fulfilled before our eyes, but the present industrial leaders will protestif they are told that they are the executors of Marx's testament," Dr. Schmalenbachwrote. While the industrialists are not trying to bringabout economic restraint, he adds, they are tools in the hands of evolution. Continuedimprovement in labor-saving machines is largely responsible for the unavoidable change,aided and abetted by the growing intensity of capitalism in making human hands moreand more superfluous. The costs of production have been increasing constantly, andthe time must come when they are so high as no longer to balance consumption. German industry and commerce are now at the crossroads, and nineteenth-century freedom is about to be lost and replaced by restraintat the hands of the Government, he said. The transition will come within a periodof a few years only. Objections by trusts and cartels to supervision will not preventor even retard the change of the entire economic system, but their resistance willactually accelerate the process of change. Dr. Schmalenbach finds no cause for public worryabout the operation of the new system even though it involves the abandonment ofthe present largely free competitive system. Monopolies will soon be assisted tomaintain themselves in supreme power. He illustrates this contention by using thecoal industry of Europe as an example. Possession of coal mines under the old systemis a curse instead of a blessing for England, Germany, France, and Belgium sincecompetition forces them to bear heavy losses through selling at prices below thecost of production to countries having no coal. This practice under the new systemwould be discontinued and selling would be done at prices fixed to protect againstloss. Directors of large cartels and monopolies, theProfessor contends, show the same lack of comprehensive outlook as did the GermanPrinces at the time of the founding of the German Empire. The consolidations of which American businessmen like Mr. Mazur speak so hopefully, and the monopolistic evolution which economistslike Professor Schmalenbach consider inevitable, may ultimately end in socialization,as Karl Marx predicted. For it is improbable that the consuming public would longsubmit to exploitation by uncontrolled private monopoly. The industrialized nationsmight not turn to communism, but the very least form of socialization which theywould adopt would involve public regulation. "Private" business would besubject to regulation much as are railroads, street cars, electric and gas companiesand other privately owned public utilities today. Strangely enough both the business men and theeconomists pleading the cause of the huge armies of investors, and the reformersand socialists pleading the cause of the consuming public are in agreement aboutthe desirability of developing the factory system, the desirability of integratingindustry, the desirability of utilizing the powers of the government in order topromote the production and distribution of factory products. Both believe in massproduction, in mass distribution, in mass consumption. Socialization, if it everarrives, as Russia tends to show, will mean a change of directors, but not of direction.We may substitute commissars for capitalists, but we will be continuing along thesame line of serialized, standardized, socialized production, distribution and consumption. I do not believe that socialization is unavoidable.It may come, but if it does come, it will not be because the state has no alternativeexcept to take over the management of the Frankensteins which our captains of industryhave been creating. When it does come, it will be because the herd-minded masseswill again do What they have so often done in the past, follow the leadership ofquantity-minded men who deliberately reject the alternatives which quality-mindedmen evolve. I am opposed to the whole tendency toward makingthe individual a cog in huge factory systems of production and distribution, quitewithout regard to whether the systems are to be individually, corporately or governmentallyowned. Complete socialization would be the final stepin the process of making man the servant of his own machines, the first step of whichwas taken when factories were first erected. The improvements in the status of the workersfor which socialists hope, if society through officials of some kind takes the placeof the present owners of industry, will not solve the problem of the quest of comfort.For socialists consider man too much merely as one of the elements in the processesof production and distribution and do not sufficiently consider how men individuallyshould live if mankind generally is to enjoy the good life. The modern factory with its application of powerto the operation of heavy and expensive machinery came into existence during thelatter part of the eighteenth century. Individual desire for profits, for huge profits,for profits which make present day factory profits relatively insignificant, wasresponsible for its birth. The first factories were established at a timewhen nearly all "boughten" products were slowly fabricated by individualcraftsmen. The factory products were naturally sold either at the prevailing highprices or at prices only a little lower than those of craft-made products. The combinationof power-driven machinery and factory methods cut the cost of making goods to fractionsof the cost upon which the prevailing level of prices was based. Manufacturers couldundersell the craftsmen and still make themselves rich in a comparatively short time.Profits that now seem fabulous were made because the public was accustomed to thehigh "handicraft" level of prices. High profits continued until productionof craft-made products virtually ceased; until factory-made goods took possessionof the market, and until competition between rival manufacturers brought prices downto a level which gave consumers part of the lower costs of factory production. Duringthis period, manufacturing fortunes had time to become firmly established factorsin world economics and the process of investing and reinvesting manufacturing profitsin still additional factories had time to enlist the cupidity of an army of quantity-mindedmen. The foundations for modern mass-production, mass-distribution,and mass-consumption were laid. The factory-made fortunes introduced into theeconomy of the world a type of capital different in many respects from any whichbad up to that time been evolved. First of all, this capital was infinitely moremobile. Even the fixed capital of the manufacturer was more mobile than the fixedcapital, if one may call it that, which formed most of the wealth of the upper classesbefore the industrial revolution. Pre-factory wealth consisted mainly of land andhouses, of all forms of capital the most immobile. Land, which was the principalsource of income of the wealthy, was practically fixed in quantity. It increasedin value only with the increase in population. This was a very slow process because,until comparatively recent times, wars and plagues regularly decimated the population.Live stock and agricultural products, Jewelry, precious metals, furnishings and otherforms of pre-industrial wealth, were all things which could at that time be accumulatedonly slowly. With the coming of the factory all this was changed.The factory revealed the golden secret of rapid capital turn-over. The profits fromthe factory accumulated, in the form of cash, bills and accounts receivable, andstocks of goods, all of them forms of wealth which were exceedingly mobile. Evenprofits in the form of additions to plant and equipment, while less mobile than theother forms of factory wealth, were still not so immobile as land. The unending stream of factory-created profitswas invested in more and more factories. Facilities for banking and trading were stimulatedinto feverish growth. Joint stock companies and limited liability companiesbegan to take the place of individual and partnership forms of factory ownership. The instrumentalities for speculation were developedand made ready for the period of expansion which began with the coming of the canaland the railroad and which has continued without respite since that time. Sir Richard Arkwright, the father of the cotton-spinningindustry, and perhaps even father of the modern system of factory production anddistribution, furnishes an example of the rapidity with which fortunes were accumulatedthrough the organization, operation, and marketing of the products of the factory.He was the youngest of thirteen children of very poor parents. The parents had littleenough to give to any of their children either of education or of other more substantialadvantages, and by the time this was distributed among so large a brood, each wasthe recipient, so far as fortune was concerned, of about as near to nothing as isconceivable. He began life as a barber. Dealing in human hair and dyeing it by aprocess of his own enabled him to accumulate a little wealth. In 1767 he gave upthis business and began his real career, first as an exploiter of inventions dealingwith spinning, and after the manufacture of yarn was firmly established, as a speculatorand trader in the yarn markets. Less, than twenty years later be was the head ofbusinesses representing a capital in excess of 200,000 pounds. He had become manytimes a millionaire by modern standards. Nothing in the previous history of mankindhad been discovered which made it possible to create peacefully such a fortune inso short a period of time. The only way in which wealth had previously been accumulatedrapidly was by seizure and conquest, or by currying the favor of those who were alreadywealthy and powerful. Before the factory these were the only alternatives availableto power-seeking men who objected to the slow process of acquiring riches by inheritanceor by minute accretions in land values as population increased. Arkwright lived to be showered with honors andattention. A grateful British king knighted him. He died enormously wealthy, theprogenitor of the modern captain of industry, the man who showed Britain what couldbe accomplished by a nation led by men like himself. Historians tend to neglect themen who followed in his footsteps; but economists cannot afford to do so. Their livesfurnish demonstration after demonstration of the proposition that factories cameinto being in the beginning, and continue to this day to be established because individualslike Arkwright see in each new field of production enormous opportunities for profit--theopportunity to sell a factory product at a high profit to a public still used toa non-factory level of prices, or willing to pay a high price for a new product becauseof the higher prices or greater disadvantages of the product which it displaces. These high profits explain the present day dominanceof our economic life by the factory system of production, distribution and consumption.Enormous sums accumulate in the hands of relatively wealthy factory owners. Thatthey should invest these sums in the erection of more factories, in the productionof the raw materials they need for them, and the development of systems of transportationfor both the raw materials and the finished products, is only natural. For they cannotconsume these sums in good living, no matter how ostentatiously they may spend money.They do not know enough about art, science and history to use them to really beautifythe earth. They can only invest them and re-invest them. So capital is always accumulating in their hands,just as it is accumulating in their banks, in their business corporations, theirinsurance companies and even in their endowments and foundations. Ingenious, cunning, ruthless, with appetiteswhetted by gargantuan visions, they are encouraged by the existence of all this capitalto develop new industries. The capital accumulated in textiles makes it easier tomake fortunes in railroads, and in turn to make fortunes in brewing and distilling;in iron and steel; in meat-packing and flour-milling, and today in automobiles, inmovies and in radio. Every advance in science is seized upon to extendthe factory system. Those first to operate successfully factories which take advantageof new scientific developments win the greatest profits. Nearly every new factoryproduct and new factory process creates at least one great fortune when it is new.Kerosene produced the Rockefeller fortune; refined sugar the Havemeyer fortune; reapersproduced the McCormick fortune; cash registers the Patterson fortune; cameras theEastman fortune and automobiles the Ford fortune. Bonanza profits on new products, fortunatelyfor the public, stimulate the building of factories in the new fields. As soon asproduction in a new field is sufficiently developed to insure profits, the factoriesin it tend to multiply often at geometric progressions. The time in which the mass production of a newproduct can be pushed past the experimental stage has persistently been shortened.What took decades to accomplish in the case of the steam railroad has taken a singlegeneration in the case of the automobile. Mass production, which had to develop bytrial and error methods in the early days of the factory, can today be applied tomaking any product as soon as the market for a product proves large enough to justifythe necessary investment in automatic machinery. The radio vacuum tube and the radio receiverindustry, as soon as the products themselves were developed, sprang into mass production.So great was the capital inflow into the industry and so efficient the machineryand techniques used in the factories, that within a few years the volume of productionfrequently exceeded the absorption capacity of the market. The world is rapidly becoming one vast factory.The frontier of the agricultural civilizations of the past was marked by the clearingsof the pioneer settlers. Where the pioneer was there was the agricultural frontier.The frontier of our modern industrial civilizations is marked by belching smokestacks.Where the factory is and the region where no factories have yet been erected begins,there is the industrial frontier. Farther and farther into the "backward"regions of the earth goes that frontier. if we assume that the first distinctly industrialcommunity was Manchester, in which Arkwright established the factory production ofyarn, then the first industrial frontier was in that tight little island that containsEngland. By 1850, the industrialists had dotted England with factories. Then thefactories began to appear across the channel in Europe and simultaneously acrossthe Atlantic in North America. Now only Asia and Africa and part of South Americaand Australia remain to be industrialized--the last frontiers which the factory willhave to conquer before the whole world will have been industrialized. Sometimes I see the factory as a reincarnationof the fabled Wandering Jew. Where the Wandering Jew directed his footsteps, therecame the Black Plague. Restlessly the Wandering Jew pushed on into every region ofthe globe. Behind him he left regions writhing in miseries as to the source of whichthe sufferers were ignorant. So it has been with the factory. Wherever the factory establishes itself, thereit introduces its special form of ugliness. Restlessly the factory pushes on into every regionof the globe. One after another the non-industrial cultures and civilizations godown before it. Highly developed civilizations like those of the Japanese and theEast Indians succumb to it precisely as do the primitive cultures of the South SeaIslanders or the African negroes. Into each region it introduces distresses and discomfortsas to the source of which the populace is largely ignorant. In every country where the factory has been establishedlong enough; in every nation in which the factory has precipitated those grave socialproblems which we shall later consider in some detail, efforts to socialize the factory--tomake it subservient to society--inevitably develop. These efforts, although rarelyinspired directly by socialism, are yet vindications of Marx, Engels, and Lassalle.For socialization and functionalization of the factory are predicated upon the basicidea that the uncontrolled private ownership of the means of production and distributionis responsible for practically all of the social maladies of the world. If every individual were willing to sacrificefreedom and initiative in the economic field, society might succeed--as the socialistsbelieve--in eliminating every trace of exploitation from the factory system. Butthe elimination of exploitation by the abolition of private ownership of productionand distribution does not reach the root of the trouble. The factory's ineradicableattributes would still remain to plague mankind. Socialization or functionalizationof the factory will never produce the Utopia for which so many idealists are working.Socialization must fail as a remedy because it does not treat with the real diseasewhich the factory system has inflicted upon mankind. Socialization must fail because it containsno balm for efficiency-scourged mankind. For the efficiency that is the quintessence offactory civilization is the real disease which the factory has inflicted upon mankind. And efficiency would remain to rob mankind ofcomfort no matter what form management and ownership of the factory might take. The factory must be efficient. It can surviveonly by becoming more and more efficient. It has to be efficient under private managementand ownership. It would have to be efficient even if private management and ownershipwere changed to public. Mankind's comfort would have to be sacrificedon the altar of the great god efficiency under socialism precisely as it has to beunder capitalism because the factory system ceases to be economic unless it isefficient enough to absorb the institutional burden which is its inescapable concomitant. What is the nature of this institutional burden?And what is its significance? With domestic production--indeed with almostany non-factory system of production--the price which is paid, or if you prefer,the sacrifice which is made in order to satisfy the individual's desire for any commodity,may be resolved into three costs: the cost of the labor necessary in fabricatingthe commodity; the cost of the materials used; and the incidental expenses not directlyclassifiable under either of these two heads. These three costs are analogous towhat are usually called the direct material cost, the direct labor cost, and theshop expense of the factory, the three comprising the manufacturing cost of a factoryproduct. With factory production these three costs are,of course, much lower than with domestic production. Factory production makes it possible to effectsavings on the cost of material by purchasing in large quantities, by eliminatingwaste and by utilizing by-products. It makes revolutionary savings on the cost oflabor possible through the division of labor and the use of labor-saving. machinery.Finally, it makes almost equally large savings possible in the shop or factory expenses.These factory expenses--the non-productive labor of firemen, engineers, oilers, etc.,the materials such as coal, oil, materials for repairs which are not directly chargeableagainst any unit of product, and of course the rent, taxes, insurance, depreciation,etc.--are distributed over the large number of units of the products made by thefactory, and are therefore materially smaller than the incidental expense per unitunder domestic production. But these savings are somewhat offset by threenew factory costs which have no real counterparts under domestic production: thetransportation costs on materials and supplies; the general office expenses of themanufacturer, and the profits which have to be added if the manufacturer is to becompensated for his effort and enterprise. The factory's transportation costs on materialsand supplies are hardly comparable with any expenses incurred in domestic production.With domestic production consumption takes place at the point of production. Butwith large scale production it is almost impossible to find both a sufficient supplyof raw materials and a sufficient market for all that is produced at the place wherethe factory is located. Transportation of both the raw materials and the finishedproducts is often necessary. Transportation of one or the other is almost inevitable. The factory's general expenses are new and hardlycomparable to any of the costs involved in domestic production because advertisingand selling expenses, credit costs, and accounting and other office expenses havetheir reason for being only because the factory has to sell what it produces. And for the same reason the manufacturer's profitis hardly comparable to anything existing under domestic production. The elaboratestructure of interest on bonds and bank loans; dividends on stock, and the variousforms which remuneration for risks and management take, are non-existent under asystem of non-factory production where the capital investment--no factory machinerybeing used--is negligible. But if these three costs were the only costsconstituting the institutional burden of the factory system, efficiency would notpresent so menacing an aspect. These three new factory costs are only a part of thefull institutional burden. Some of the more important of the other costs are wholesalingtransportation and warehousing costs, wholesaling expenses, wholesaling profits,retailing transportation and warehousing costs, retailing expenses, retailing profits. Factory production must be efficient enough tocarry the burden of all these distribution costs because, with a volume of productionin excess of the demands of the market in its immediate neighborhood, some such costlysystem of distribution is necessary. It must be efficient enough to carry the burdenof all transportation costs and distributors' expenses and profits in addition tothe costs of its own which are usually lumped together under the term "overhead." Let the factory fail to absorb these costs andit becomes impossible for it to supply consumers as economically as they can producefor themselves or buy from a custom maker. Mankind would then find a revival of domesticand custom production worth while. 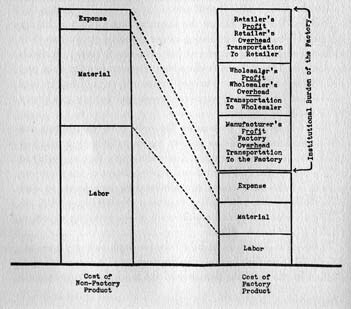 The diagram makes graphic the fact that whatthe consumers of factory products are supposed to gain through the lowering of thedirect cost of manufacturing--through lower costs of material, labor and direct factoryexpense--they tend to lose in what I have called the institutional burden of thefactory system. With factory production large capital is necessaryfor plant, machinery and materials. It is secured by borrowing; by forming partnerships;by incorporation. Interest, profits, and dividends are used to pay those who furnishcapital. Depreciation and obsolescence of plant and equipment form a major problem;the larger the machinery, the greater is not only the necessity of providing forwear and tear, but of setting up reserves to make it possible to acquire new machinesand to use new processes wherever their invention makes the use of older machineryunprofitable. Overhead is relatively large not only becauseof these expenses but because of the high cost of superintendence. The larger thefactory, the greater the superintendence. Large numbers of workers cannot be directedby the methods which were efficient enough when a master workman was producing, underthe handicraft system, surrounded by a group of apprentices. The military systemof management, in which all power and authority emanate from one man who keeps controlof all details is inexpensive but it is efficient only in the small shop. In thefactory, the departmental system develops inevitably. Work is divided into departmentseach under absolute control of one man who is in turn under the control of a superintendentwho gives general instructions and holds the department foremen responsible for results.In the largest factories, combinations of what are known as the functional systemand the departmental system of management are used. The work of management is dividedso that each supervisor shall have as few functions as possible. There are gang bosses,speed bosses, inspectors, repair bosses, planning department representatives andof course corresponding "office" supervisors: designers, planners, recordkeepers and cost clerks. Similar additions to the overhead develop in the officeof the factory. There are office managers, personnel managers, sales managers, advertisingmanagers and traffic managers. When more than one plant has to be supervised or anumber of branch offices must be managed a whole hierarchy of higher supervisorsare necessary: above the superintendents of the plants there are engineers, auditors,general managers, treasurers, presidents and finally directors. All tend to absorbthe reductions in manufacturing costs which are made possible by the factory machineryand factory methods. If the mass of goods produced by the factoryis to be absorbed, mass distribution has to be provided. Time and place utilitieshave to be created. Distant markets must be secured. The goods must be warehousedat convenient points in anticipation of seasonal demand. Mass consumption must becreated through salesmanship and advertising. As a result, approximately two-thirdsof what the consumer of today pays for the products of the factory is payment fordistributing the product; less than a third is payment for manufacturing it. I have discussed the distribution question indetail in "The Distribution Age," and the part advertising plays in thecreation of mass consumption in "National Advertising vs. Prosperity. "In these two books, I have assembled what seems to me irrefutable evidence that asfactories grow larger and larger, as the industrialization becomes more and morecomplete, distribution costs rise higher and higher. In 1870 only 10% of the workingpopulation of the United States was engaged in transporting and distributing thecommodities then produced. Ten years later, this increased to 11% In the next tenyears it increased to 14%. By 1900, it was 16%. The average rise during these 30years was about 1-1/2% per decade. Beginning with 1900, the rate of increase becameprogressively more rapid. By 1910, it had jumped to 20%. By 1920, fifty years afterit was only 10%, it had become 25%. Even if the rate of progression ceases to increase,within the next fifty years there will be one worker engaged in transportation anddistribution for every worker engaged in farming or manufacturing. As the factory increases in size--as the contributionof labor to production becomes smaller and that of machinery and power larger--theinstitutional burden becomes greater and greater. We find almost a natural law governingthe growth of factories: the larger the factory, the greater the inverse relationshipof the general overhead and distribution costs to labor and material costs. The problemsof efficiency of operations and of volume of sales increase in importance, whilethose of wages and of raw material costs decrease in importance. Indeed, in spiteof the intensity of modern competition, a Henry Ford can afford to pay higher wagesthan prevail in the general labor market and to use the most expensive of raw materials,and still accumulate a gigantic fortune. He can do this because his product is stillrelatively a new one and his industry still immature. He can secure volume distributionat low cost, and he has the necessary skill to operate a gigantic factory efficiently.As the automobile industry reaches maturity, however, this will become more and moredifficult. In young industries, like the automobile industry,efficiency produces enormous profits. In old industries, like the textile industry,only the most rigorous efficiency enables the manufacturer to avert bankruptcy. Managementin a textile mill is a race between covering the overhead and going into bankruptcy. In new industries, profits are the spur to efficiency. In old industries, survival is the spur to efficiency. The factory has to be operated with an efficiencyproportioned to the institutional burden because only to a limited extent can itraise prices to cover increasing overhead and distribution costs. The individual factory cannot raise prices beyonda certain limit because of the competition of rival factories. A whole industry cannot raise prices beyond acertain limit because its products would drive consumers either to the products ofother industries or to the production of the goods for themselves. An individual bakery cannot raise the price ofbread, for instance, beyond the neighborhood price without losing its business torival bakeries. If all the bakeries in the country were consolidated, or bread bakingwere taken over by society, the price of bread could still not be raised beyond acertain point because consumers would then be driven to baking bread for themselves.When prices are raised to the point fixed by these limits, further margins for overheadand distribution costs can only be secured by increased efficiency in production. As long as the factory management is efficientand the sales volume adequate, the overhead is covered; interest and dividends arepaid; the securities of the corporation rise in value. If the factory managementis inefficient, and the overhead is not covered, capital charges are not met. Thesecurities then depreciate in value until the equities they represent are completelydissipated. The corporation operating the factory then fails. Liquidation of itsassets turns the factory over to a new corporation. The new corporation may represent "strongerhands." The factory is then absorbed and operated as a part of a merger or consolidationof some kind. Occasionally, however, the factory which has been taken over is notoperated at all. Production is concentrated in other factories owned by the new corporation.Often, however, the new corporation is not strong enough to indulge in this drasticmethod of insuring profits. It may merely represent new capital which acquires theplant and the machinery at a bargain and hopes to operate the factory successfullybecause its investment is smaller than that of the corporation which failed. It is an ingenious system. Considering it objectively,it produces for mankind with amazing reliability. It will continue to function atleast as well as it does today, as long as scientific management devises new wrinklesin efficiency to offset rising overhead and distribution costs. The institutional burden is largely an inherentattribute of the factory system. Mere changes in methods of control and ownershipwill not eliminate it. Socialism, for instance, would abolish all thepresent charges for rent, interest, and profit. Theoretically this would reduce thecost of capital. Theoretically this would eliminate the surplus profits of capitalists.Actually, the saving would be negligible because in taking over all factories notonly would the gains of the successful factories be taken over, but all the lossesof the unsuccessful ones. Cooperation, on the other hand, would operatethe distribution system in the interest of consumers and the factory system in theinterests of the producers and workers. Theoretically the consumers would be insuredagainst exploitation by the "middlemen." Theoretically the producers andworkers would be protected against exploitation by the factory owners. Actually,the protection hoped for could be realized only through the agency of exceptionallyable and honest management and not through any elimination of the institutional burdenof the factory system itself . For most of the costs of producing and distributingfactory products consist of items which would remain no matter what the form of controlor what the kind of ownership. Some economic efforts must be made in order to accumulatecapital, and whatever the form these efforts take, consumers must be charged enoughto pay the actual cost of accumulating and using the capital. Some economic effortsmust be made for meeting depreciation and obsolescence in buildings, machinery, andmaterials. And again consumers must be made to pay for the actual cost of maintainingand replacing the equipment essential to the factory. And distribution also has tangibleand very real economic costs, and consumers must be made to pay these costs if thefactory's products are to be made available when consumers want them and in the placeswhere consumers want to procure them. There are other items in the institutionalburden which cannot be escaped by any mere change in control--changes of fashionaffecting demand, new methods which make old machinery worthless, and new industrieswhich tend to render the old ones un-economic. Thus there is no escape from the conclusion thatthe institutional burden of the factory system as a whole cannot be eliminated bya shift of factory control from individual owners to corporations; from corporationsto trusts and from trusts to government departments. The economic obligation to be efficient cannotbe evaded by abolishing private ownership of the factory and outlawing private profit.Socialization may actually increase the overhead and so make an even more rigorousefficiency in production necessary. Overhead expenses, transportation and distributioncosts and practically all the costs which comprise the institutional burden of thefactory system are not arbitrary inventions of capitalism. The state owned and operated factory would laborunder substantially the same inherent and unavoidable compulsion to be efficientas does the privately owned factory. If it failed in efficiency, it would be unableto furnish the public goods at a cost as low as that provided by the privately ownedfactory. The truth about the cost of its products could be concealed from the publicby making production a state monopoly and thus preventing privately owned factoriesfrom making odious price comparisons. Making it impossible for the public to buyfrom an alternative source of supply would enable the state owned factory to survive,but the factory would nevertheless be an economic failure. It would absorb more laborand more material than similar factories under capitalism and yet furnish the publica smaller quantity of finished goods. Thus we are driven to conclude that no matterwhat the form of control and ownership, the compulsion to operate the factory efficientlyis inherent and inescapable. It must be operated efficiently or fail as a factory,with individual losses under private ownership; with government losses under publicownership. Efficiency is, therefore, the quintessence ofthe factory system. Efficiency determines where factories are located; what equipmentis used in them; how large they are to be; what methods and practices are to prevailin their operation. For only if they are efficient can they absorb the functionalhandicap of the institutional burden and deliver an economic product to the public. We are indebted to the late Frederick WinslowTaylor, the founder of scientific management, for the first exposition of the principlethat factory efficiency is dependent upon the application to factory operations ofthe laws which govern maximum production from the machinery, the materials and thelabor available to the management. Factory efficiency is high or low in accordancewith the extent to which the management can make the workers accommodate themselvesto the formulae which the efficiency engineers evolve. It is not, therefore, thenative capacity of the workers, much less their personal desires about work, whichdetermines how they work in the efficient factory. It is the factory's impersonalnecessities that determine how the workers must work. And the management must discoverits factory's necessities or fall behind in the competition with those which do. An illustration from "The Principles ofScientific Management" gives some idea of what the factory can afford to payfor the development of formulae that lead to greater efficiency. In the fall of 1880,William Sellers, President of the Midvale Steel Company, asked Taylor to conducta series of experiments designed to answer two questions which would add greatlyto the efficiency of all the company's machine work. At the time the experimentswere begun it was believed that it would not take more than six months to developthe necessary formulae. As a matter of fact, the experiments were carried on, withoccasional interruptions, for 26 years and from $150,000 to $200,000 was spent inmaking them. Second, what feeds should they use in their machines? Once such formulae have been found, they imposethemselves upon all factories. The Midvale Steel Company discovers a new andmore efficient method of production. It cuts its costs and lowers its prices; enlargesits sales and increases its profits. In order to meet the Midvale Steel Company'scompetition, competing steel companies must adopt the new methods. They must becomeequally efficient or they must reconcile themselves to more or less speedy failure. Both the owners of the factories and the factoryworkers find themselves forced to conform to the necessities of a Frankenstein, theinevitability of which both accept, precisely as both owners and slaves once acceptedthe inevitability of slavery. And there is no escape from this inevitabilityof efficiency by an abandonment of private ownership. There is only one escape: thatis by an abandonment of all further development of the factory. This would stabilizeefficiency at the standard which prevails today. But it is an escape in some respectsworse than the evil to be remedied. Cooperation and not individualism is implicitin the factory system. As efficiency increases, cooperation will therefore increase.With maximum efficiency the goal, cooperation will not be dispensed with once itis attained within individual factories. Cooperation inside factories will be followedby cooperation between factories, and finally, by cooperation between all the factorsin production and distribution. Efficiency thus imposes upon the factory-dominatedworld a process of integration, centralization and finally, if uncontrolled privatemonopoly is not to be permitted to exploit the public, some form of socialization. Added impetus is being given to this tendency,especially in the older industries, by the threatening aspect of over-industrialization.Under our present economic regime factories, as we have seen, tend to proliferateat a constantly accelerating rate. They would probably increase similarly under anyother regime in which policy was in the hands of a quantity-minded class of managersand rulers. But under present day conditions, the immediate consequence of over-industrializationto the individual factory owner, and therefore to the workers and those dependentupon the operation of the factory for a market for raw materials and supplies, isa reduction of net income. With more factories than are really needed seekingto market their products, and to operate at least at such a proportion of their totalcapacity as will enable them to meet overhead expenses, prices frequently fall belowthe cost of production. Industries in which this state of affairs hasbecome chronic--many branches of the textile industry and certain branches of thefood industry--are social and economic menaces. What they produce is sold at low"distress" prices to the public, but the communities in which the factoriesare located suffer from the unemployment and underpayment of labor, and from theloss of profits and the bankruptcies of the owners of the factories. These factorytowns become economic plague spots, in which consuming-power for the products ofother industries is at a very low point because the residents have not income enoughto buy and to consume a normal volume of commodities. Confronted by the problem of stabilizing profitsand stabilizing production, American manufacturers in spite of their boasted individualismare beginning to turn to cooperation and governmental assistance for salvation. They are trying to solve the problem by raisingprices. Prices are raised by controlling production; monopolizing raw materials;licensing patents; stimulating consumption, (usually by lessening consumption ofthe products of rival industries), and by cooperative price-fixing. They are trying to solve the problem by reducingcosts--by using more and more automatic machinery, by working longer hours, and bylowering wages. And now they are beginning to try to solve theproblem by enlisting the assistance of the government. The tendency in this directionis becoming plainer all the time. The oil industry furnishes an excellent illustrationof it. A report of the Committee of Eleven of the American Petroleum Institute in1925 showed that the industry at that time was unaware of the existence of any seriousproblem. Their report stated that the industry was confident of its ability to secure"prices that will provide a return to producers, refiners, and distributorscommensurate with the risk involved and the capital invested." The total domesticoutput of oil, however, was only 763,743,000 barrels that year-slightly more thanthe average production of the f our years 1923-26 inclusive. The year 1927, however,produced an output of 905,800,000 barrels. The industry began to discover a problem. Lowerprices for petroleum and its products; increased expense for storage facilities;diminished profits and outright losses could not be ignored. Prices of leading oilstocks moved to new low levels in the face of a rise in the price of stocks generally.Even the stocks of the Standard Oil of New Jersey and Standard Oil of New York werebeing affected. A Committee of Nine was formed, consisting ofthree representatives of the oil industry, three of the mineral section of the AmericanBar Association, and three of the Federal Government. This committee brought in areport radically different from that of the Committee of Eleven. It was plain tothis committee that the industry had to save itself by cooperative development ofoil pools by "voluntary" agreement. In order to secure the necessary "voluntary"agreements, the government was to remove any unnecessary obstacles--that, is, suspendthe enforcement of the Sherman Anti-Trust Law--and in addition to bring to bear whateverpressure it "reasonably" could exert. As a step in this direction, theState and Federal anti-trust laws were to be amended so as to remove unequivocallyfrom their purview voluntary agreements looking to the restriction of output andthe cooperative development and production of oil. If in spite of help from such "voluntary"cooperation the industry ultimately ceases to furnish possibilities of profits, thenthe owners of the industry will naturally strive to "unload" it on thegovernment, and if the government proves reluctant about taking over the losing venture,the public’s need of the products of the industry will force it to take it over. These various efforts of American manufacturersto escape from the effects of over-industrialization, carefully concealed from thepublic, run counter to existing law, to existing folkways and to existing economicphilosophy. They involve conventional business men and conventional economists ina maze of logical contradictions--natural consequences of the conflict between businessnecessity and existing statutes, customs and philosophies. Ultimately economic necessity will prevail. New laws, new customs, new economic theories--whichpermit of greater cooperation, greater integration, greater efficiency--will takethe place of those which prevail today. But efficiency will remain--to whip and driveand scourge the victims of this civilization.